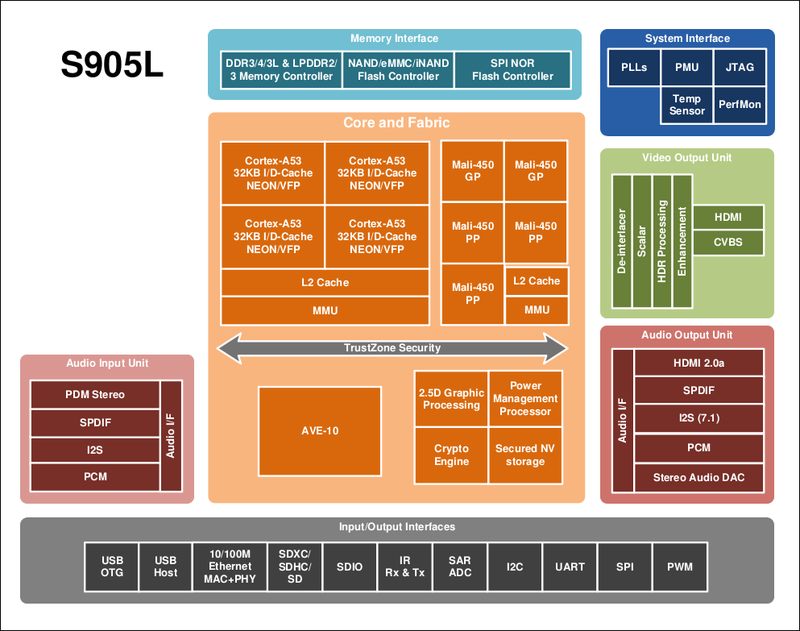 Amlogic has apparently decided to launch yet another quad core Cortex A53 processor with Amlogic S905L, which appears to be based on Amlogic S905X with built-in stereo audio codec and 10/100M Ethernet PHY & MAC, HDR support, but without VP9 codec, camera interface, nor TS inputs, so it looks like a cost-down version purely designed for OTT/IP TV boxes. 2.5D GPU – Fast bitblt engine with dual inputs and single output, programmable raster operations (ROP) and polyphase scaling filter, etc..
Video Post-Processing Engine – HDR10 & HLG HDR processing, motion adaptive 3D noise reduction filter, advanced motion adaptive edge enhancing de-interlacing engine, 3:2 pull-down support, deblocking fliters, etc..
Amlogic S905L does not bring new features, but closely matches the requirements of the vast majority of TV boxes on the market, since the camera and tuner interfaces are seldom used, and 4K VP9 videos are still a rarity, except through YouTube app which does not enable 4K on such devices as Android TV operating system is required. All that means is that we should expect more $20 TV boxes soon. Well their AMLogic money but now you have s905, s905x, s905L bottom chips. Customers are going to love the confusion. Do you know how much these amlogic s905 chips sell for in quantities approximately? What exactly TS inputs do?? I can connect dvb tuners? or what?? TS (Transport Stream) inputs + demux are made for tuners. You have other processor models for Gigabit. I also have specs for S905D, but it looks like exactly like S905X, except for the added “Digital Television Interface”, and the package is 15x15mm instead of 13x13mm. ‘Crypto extension’ as in ‘ARMv8 crypto extension’ or as in ‘Amlogic crypto dma’ ? The full sentence in “CPU subsystem” section reads “ARMv8-A architecture with Neon and Crypto extensions”. Amlogic also have their own Crypto Engine has described in the post above.